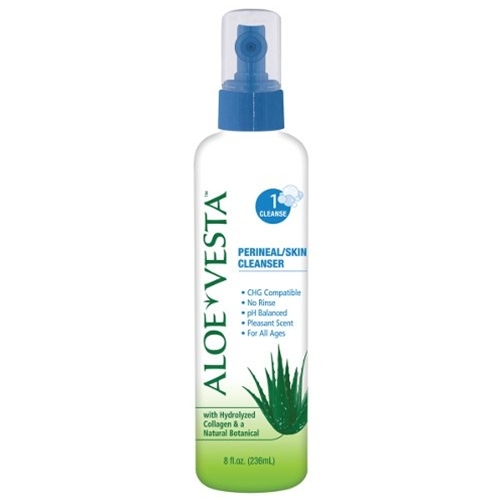 ConvaTec Aloe Vesta Perineal Skin Cleanser from HealthyKin.com is designed for incontinence cleansing. This liquid skin cleanser deodorizes with a fresh lemon fragrance. Dispensed as a liquid spray it is more convenient than soap and water cleansing from a basin. This is a great product, not only for incontinence problems but to use for a complete bath for the disabled. Was given the product when in hospital and have been using it ever since. I like that the order is delivered so fast. I don't like the confusion in ordering. It seems there is a 4 oz. and an 8 oz. bottle and they are the same price? I don't like that you can't be reached by phone. The order page could use some adjustments to make it less confusing. Discovered this product on a hospital stay. Like the product. Thought my truck driver son could benefit from its use. Had expected he would be gone again before I received it. Not so. It came very quickly. A day or two from order date. Most pleased. Great product. Was introduced to it at a hospital stay and now use it in place of flushable wipes.Actually a purse size container would be convenient as well. VERY GOOD PRODUCT HAVE USED IT FOR SEVERAL YEARS. All your products are just TOO GOOD!! great smelling perineal cleaner and works very well also. Fast delivery and a great price. Best perineal skin cleanser out there which is also reasonably priced.